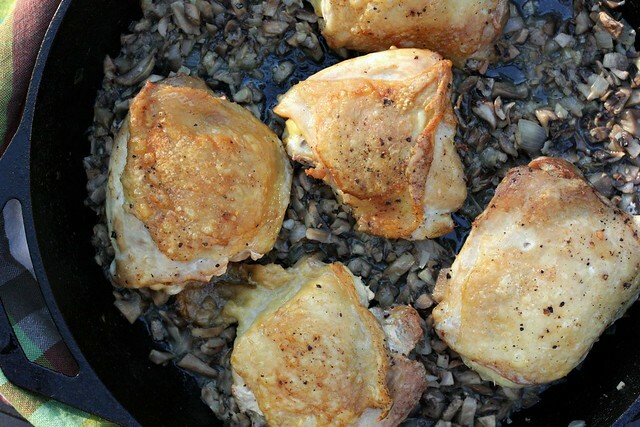 Jacques Pepin’s Crusty Chicken Thighs with Mushroom Sauce – Elly Says Opa! My love for chicken thighs has been well-documented (and then documented some more. And more. And more.) on this blog. Even better than chicken thighs in general are chicken thighs with crispy skin. Basically, the best of all things poultry-related. The skin of these thighs is made crispy in a unique way – by starting them off in a cold skillet, and not turning on the heat until after they’re in the pan. I like to use cast iron. The thighs get a crispy, well-browned skin, and are cooked through by covering the pan, which assures they don’t dry out or get to the point where the skin gets too dark but the inside is still raw. The only fat used is that made by the rendered skin – and there will be quite a bit of it by the end (you pour off much of it, though). It gives the mushroom sauce (which is really not much of a “sauce” for the record) an even more luxurious depth of flavor. The best thing about this dish is that you don’t have to turn the oven on to achieve that crispy, wonderful skin, which is such a great thing right now in million degree temps (yes, it’s barely June and I’m already complaining about the heat. Deal with it). I can see myself cooking chicken this way and doing different pan sauces or other variations on this simple but wholly satisfying dish. Set the chicken thighs skin-side down on a cutting board. Cut a 1/2 inch thick slash on either side of the thigh bone. Season the thighs on both sides with 1/2 teaspoon of salt and 1/2 teaspoon of pepper. 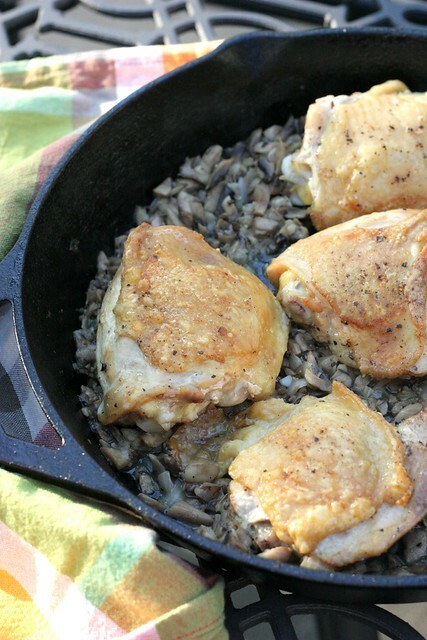 Place the chicken thighs skin-side down in a non-stick skillet (I like cast iron). Then, turn the heat to high. When the chicken starts to sizzle, reduce the heat to medium and move the thighs around to make sure they aren't sticking to the skillet. Cover the skillet and cook for 18-20 minutes or until the internal temperature reaches 165º, occasionally checking to make sure it's not sticking. If the skin is browning too much after 10 minutes, turn the heat to low. Remove the chicken to a plate or warm oven. Pour off all but 2 tablespoons of the chicken fat in the skillet. Turn the heat to high and then add the onion, garlic, and mushrooms. Sauté, stirring often, for about 3 minutes. Sprinkle in the remaining 1/4 teaspoon of salt and 1/4 teaspoon of pepper. Pour in the wine. Continue to cook for one minute over high heat until the sauce reduces. To serve, spoon some of the mushroom sauce onto four plates. Place a thigh in the middle of the sauce, spoon some sauce over, and sprinkle on the chives.